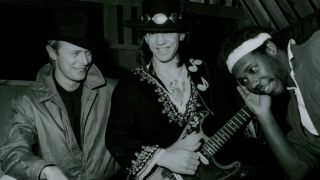 David Bowie, Stevie Ray Vaughan, Nile Rodgers recording Let's Dance. Nile Rodgers sat down with Guitar Techniques back in 2007 and recounted his time working with Bowie on Let's Dance. "That is my most rewarding production to date. Even though it clearly sounds like David Bowie - his voice is so distinctive - when you hear the tracks and the guitars it sounds like a Nile Rodgers recording in the tradition of Chic and Sister Sledge. "When David came to me with the songs he believed they could be hits. When I first heard them I thought he was crazy. This was a guy who I had idolised all my life. I loved Ziggy Stardust, Young Americans and Heroes but I thought he was being mean and cruel to me, putting me to a test. The truth is I could not have done something like Let's Dance without David." "I thought he wanted me to act like every other jerk in the music business and go, 'Sure David, I think these songs are great'. At best they were okay but not what I consider hits. "I called at least three friends that knew David and asked if he was playing a trick on me. They seemed to think he was serious. Then I began to realise that an artist like David paints with a wider palette. In other words, he can write an artistic song and have an audience that will listen to that. "When David Bowie wrote Let's Dance I went to his house in Switzerland and he played it to me on a 12-string guitar like it was a folk song. I thought, "You can play that, call it Let's Dance and get away with it?" I was shocked. In my world if I called a song Let's Dance and it doesn't make anyone dance it's a flop, period. "Then he played China Girl, which he wrote with Iggy Pop. Again, I didn't think his incarnation of it could be a hit. He thought it was great and I was like 'Oh man!'. So when I got to work on this song with the band we got things sorted. Trouble was, I was totally afraid because I thought he would hate it. "So I pulled him aside and tentatively suggested how I thought the song should start. I played the intro guitar bit [the clean guitar part in fourths] and he looked at me and said, "Wow, that's great!" So I said, "You think that's great? Hey guys, let's do this!" and the band played the song. He really loved it and so we did it like that. "That's the most nervous I have been in my life, but it turned out to be a million seller. Bear in mind everything else on that album had been recorded already, either by Bowie or by somebody else. Somebody else had done Modern Love; he'd done China Girl with Iggy and Cat People with Giorgio Moroder. I thought he wanted me to act like every other jerk in the music business and go, 'Sure David, I think these songs are great'." "The point I'm making is that a lot of people only know my versions. As a producer, you have this framework to give a song a big life and hopefully a big audience. And that's what David asked me to do: "Nile, I want an album of hits." "The truth is I could not have done something like Let's Dance without David. With Chic, no radio station would have played it but with David, the music was genius. That is what I love about being a producer. I can cross over political boundaries. It's not my face and reputation that's being sold. I can work behind the scenes and do my stuff, but it's people like Bowie who are presenting it to the world. "So when David phoned me to do the Black Tie White Noise album later on I was really honoured. I thought he was thinking like me: 'let's crush Let's Dance'! I knew we could do it. But David didn't want to compete with himself and said so. "I thought we should, otherwise why had he called me up? But as a producer my role is to help an artist realise their vision and in this regard I think I did with Black Tie, White Noise."